If it is re-released by the publisher or manufacturer we can let you know by email. Just complete the form below and we'll do the rest. A Snoodles Tale DVD presents a very important VeggieTale lesson to children in self worth. Through Snoodle-Doo children learn to be true to themselves and to not be afraid at what others think of them. Through pictures that others paint of Snoodle-Doo - he learns we are all fearfully and wonderfully made in the image of our creator. Dr Jiggle and Mr Sly are also included in this DVD - inspired by the tale of Dr Jekyll, Mr Hyde and every Veggie's desire to disco the night away! Families will be laughing along with Dr Jiggle as they learn about not being afraid of what others think and to be true who they are. 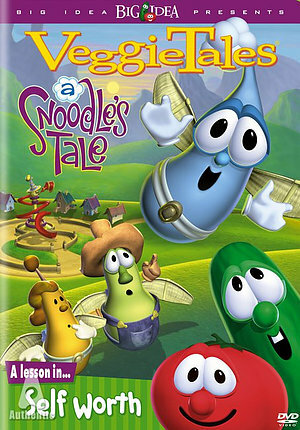 A Snoodles Tale by Veggie Tales was published by Authentic in July 2011 and is our 10818th best seller. The ISBN for A Snoodles Tale is 5060256820178. Be the first to review A Snoodles Tale! Got a question? No problem! Just click here to ask us about A Snoodles Tale.